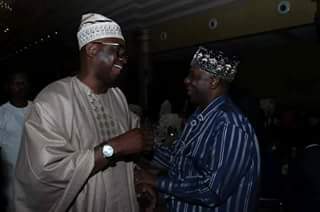 FAYOSE and AMEACHI yesterday at Oriental Hotel in Lagos laughing out loud. commonsense. This men only rants, fight and insult themselves on the TV stations, newspapers and Internet NOT physical gun shooting nor machetes butchering. FOOL on planet Earth, let's fight online and shake ourselves physically to shame them that we are also ONE.